George East A Year Behind Bars. I’m probably the worst kind of non-smoker … the ‘crusading ex-smoker’. That’s the kind of guy who, having successfully forsworn the Evil Weed, tries to persuade those around him to do the same. So, I’m probably the last person who should be writing about brown bars. The Brown Bar is so called because the walls have the colour and patina of old ivory. Not, though, because of paint … that was originally white. It’s been stained to that colour by years of tobacco smoke. The brown bar is usually found in the Low Countries, especially in Amsterdam, but there’s a well-known known one in Brussels, the ‘Mort Subite’, in the rather ponderously named Rue Montaigne aux Herbes Potagères, just to the north of Grand’Place. It’s in a rather insalubrious looking street, and that maybe discourages the ‘wrong’ kind of tourist. But, it’s worth it to walk the street, and go in. The name translates as ‘Sudden Death’. That’s not a comment on the quality of the catering; I remember at least one memorable belt-bustin’ repast here. Being English, I like my pubs to have a bit of history, and the Mort Subite has plenty. 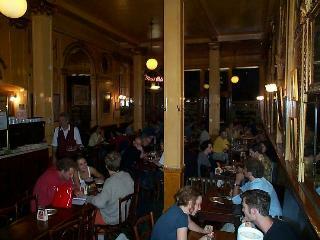 In 1910, one Théophile Vasson ran a bar called ‘La Cour Royale’, next door to the National Bank of Belgium. The bank clerks liked to spend their lunch-breaks there, and were fond of a dice-game called ‘421′. M. Vasson moved to the present location in 1928, and remembered his former customers by calling his new bar ‘Mort Subite’. It prospered … in only two years, dice-playing bank clerks were left far behind, when the then King of the Belgians stopped by for a brew. On the wall, there’s still a yellowing photograph of King Albert I, uniformed and be-medalled, and looking like he’s auditioning for a part in ‘Beau Geste’. He’s clearly enjoying his beer … but, remember this is Belgium; it’s probably against the law not to! Not a lot has changed since they hung that picture on the wall. Except, the picture … and the walls … got yellower! The inside of the Mort Subite is blazing with light; they like to see and be seen … and they are inordinately proud of their tar-soaked walls. A guide I down-loaded from the Web told me that, on Saturday nights, ‘ … every smoker in Belgium is there….’. Encouraged, no doubt, to make their contribution to the décor? 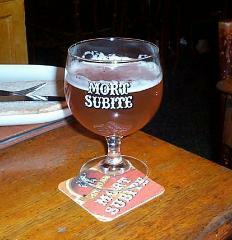 ‘Mort Subite’ is also the name for some of the good selection of beers on offer. But, I won’t bore you with a catalogue of them … I’m well aware that, even among hardened beer-swillers, zymurgy isn’t the most fascinating of subjects. But, I could change my mind if they sent along a couple of cases of gueuze! For those who like good beer and good atmosphere, it’s well worth a call. It has a special place in my heart, because it was here, one day in 1997, that two campaigns were launched. That was the day I started my quest to ‘research’ as many kinds of Belgian beer as possible. It was also the day I had a long, long look at those walls … and I haven’t smoked since! The first place I visited in Brussels. I was with a local. Then went on to La Becasse. I always like trying to make the waiters laugh because I’m sure they will be sacked if they smile 😉 I joke (a little). Can’t wait for Belgium to get on and ban smoking in all bars.They currently have the sloppy compromise they were going to introduce in the UK..